click: Make a run on R&D or HQ and trash 2 or more cards from your grip. Whenever you access cards from that server during this run, access 1 additional card for every 2 cards trashed. "Sure, the implantation was fine, but it pumps Burn. Did you think it wouldn't hurt?" When does the Runner trash cards to use Severnius Stim Implant? The cards are trashed as the run is initiated. 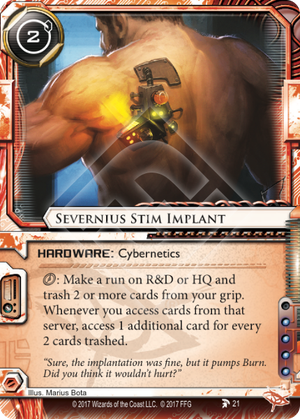 After using Severnius Stim Implant, does the Runner access additional cards from that server in later runs or card abilities? No. The number of cards trashed can only be referenced by the ability itself during the run initiated by that ability. 1) Stim Dealer + Duggar's to initiate a mega-run with 15+ cards in hand. EDIT: You can also do this with Emptied Mind instead of Stim Dealer if you like living dangerously. Gives you a decent multi-access every turn. 3) Beach Party and/or Public Sympathy paired with something like Ekomind and the Sage/Savant/Adept breakers. 5) The console Obelus can help keep cards in your grip after your runs if you aren't going the Emptied Mind route. No matter what I do, I keep ending up with something that's usually comparable to a The Maker's Eye on the low end, and to a Medium/Incubator dig on the high end. And those require far fewer pieces (and much less sacrifice in terms of deck destruction) to make work. I'm hopeful that somebody else will find a way to make this work, because I love the flavor and I'd really like to be able to turn extra cards into extra access (sorta like how Faust turned extra cards into successful runs). All of that said, of course, slapping #1 and #3 into the same deck is a LOT of fun. You'll lose, but you'll laugh the entire time. Multi-access is powerful and there aren't really that many cards that provide it. Severnius Stim Implant is a powerful new tool, at 4 influence effectively only for anarchs. It's a bit of a complicated setup. You first install it. Then at a later point you use the ability to make a run on R&D or HQ. At that point you have to trash cards from your grip (you choose which ones). For every 2 cards you trash you will access another card from the chosen server from this point forward. The run does not have to be successful in order to get the extra access(es) in the future and the extra access(es) already happen in the run you make with Severnius Stim Implant. Severnius Stim Implant is hardware so it doesn't suffer from MU limitations like programs and isn't as easy trashable with tags as resources. As I read the card you can use the ability multiple times and the effect stacks. You can even use the same stim implant on both R&D and HQ and they each have their own tally. So you can run on R&D, trash 2, get one extra access and in the future run on HQ, trash 4, get two extra access on HQ while keeping the existing extra accesses from Severnius Stim Implant on both R&D and HQ. This is great. The big downside of Severnius Stim Implant is that you do a run with a reduced hand size which is potentially risky. Building up your extra accesses over multiple runs reduces that risk. Comparing Severnius Stim Implant with Medium for R&D multi-access Severnius is weaker in the long run. If you can consistently get multi-accesses on R&D Medium will eventually snowball into a victory while Severnius doesn't profit from extra runs. Severnius does let you access extra cards in the run that charges it, which can be useful if R&D isn't easily accessible. Medium of course doesn't let you do multi-access on HQ and it's here that Severnius Stim Implant really shines. Accessing 2 cards from HQ gives you a good shot at accessing agenda's, accessing 3 cards from HQ makes it likely you access agenda's even if there's 1 agenda on a full HQ. And 3 card multi-access with Severnius Stim Implant isn't really that expensive, trashing 4 cards from your hand, possibly over the course of two turns. Criminals have events like Legwork which give the same multi-access boost as a 4-cards-trashed Severnius Stim Implant and the soon-to-be-rotated HQ Interface is the same as Severnius Stim Implant with 2 cards trashed. The closest thing anarchs have to Severnius Stim Implant for HQ is Nerve Agent, but that one will cycle out soon. It's hard to predict how strong a card will be in practice just from static analysis of the card pool but I'm going to call Severnius Stim Implant a near-staple in anarch decks in the future. As a multi-tool for R&D and HQ accesses it's flexible and meets a demand in nearly every deck. The cost is slightly painful but nothing anarchs aren't used to (Faust). There's no obvious and widely counterplay to Severnius Stim Implant like there is to Medium in the form of Cyberdex Virus Suite. All that raises the power level of Severnius Stim Implant, though I don't think it's at the point of being overpowered.